This entry was posted in Uncategorized and tagged Accessory, Broconi, Handset, Phone, Retro, Smartphone, Technology by christao408. Bookmark the permalink. omg – hahahaha. I still use an old cellphone while J has a sleek BB. They carry them at almost all Urban Outfitters and Kitsons I’ve been to in California :]Aren’t you excited for the iPhone 5 coming out in the beginning of Fall? You happened to have chosen my favourite word in the dictionary, and no, it’s not apple! Naturally, since I’m a computer dunce, I have no idea what the hello you just said……. That is funny and mind boggling at the same time. I still use an old Motorola cell phone. The company keeps telling me that I am eligible for a new phone and to update the one I have. I want nothing to do with it. When I first saw this accessory, my first reaction was, “What a stupid accessory.” And then once day, I actually saw someone use this on the street. “What a stupid person.” was one of my more benign thoughts. It shows people will buy everything. I saw that back in 2005 in TW. Wonder what will come next. Time to make more money. Maybe the rotary cellphone will make it. Anyone over age of 20. I remember those phones. We still had one phone that was about 30 years old until about 5 years ago. hehehe! In pink no less! I always wanted a pink phone but ours were always almond… When I got my first apartment I bought a powder blue one! I bought my first smartphone just two weeks ago. This blog of yours cannot appear at a more appropriate time. People try to design a phone that is left sided or right handed. At least the phone assessory is side neutral and avoids radiation.Pink is a nice color if it doesn’t clash too much. However among different colored stuff it stands out and prevents getting lost. @Kellsbella – Serendipity, right? Just so happens I just used it on another comment. @agmhkg – Why did you use it only once? Just not practical? @Inciteful – A little dry humor as a palate cleanser between food entries. @Grannys_Place – I’m struck by how odd it will be for the generation that is growing up now – I’m thinking of my nieces, who are in primary school – to not know a world of rotary dial phones, tape cassette answering machines, the initial touch-tone phones, etc. My how things have changed in just a few years! @baldmike2004 – Thanks for your comment Michaelt. 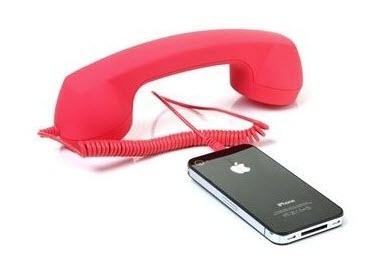 I’m sure that the retro handset will fit the new iPhone. Speaking of the future that never happened, I’m reminded of Tomorrowland at Disneyland and how the vision of the future was very different from what came to pass. @PPhilip – The funny thing is, my grandfather (who is in his 90s) emailed me after reading this post and wants to know more about the handset. It seems that he finds his mobile phone hard to use with his hearing aids and thinks the handset might make it easier to use. With the handset available only in black (“no, that looks too much like our TV remote controls”) and vivid colors like pink, yellow, or gold, I think he’ll have to settle for some bright color. @ClimbUpTreesToLookForFish – Welcome to the world of technology. I have yet to buy a smartphone, preferring an old Nokia “candy bar” phone. Maybe I will cave in before the year’s end, though, and buy one…@murisopsis – The name “almond” for that bland color always amused me. Why not “blanched almond”? @KnightInCROATIANarmor – Yes, I guess for some people, the technology might not be quite as unfamiliar. My family was late in adopting these types of technologies, so we had a rotary dial phone forever, were the last family I knew to get an answering machine, etc. @Fatcat723 – There is certainly a market for relatively “useless” stuff, isn’t there? @Lakakalo – Oh, yes, I have heard of this. Another one of those “really! ?” things…@ZenPaper – Easier to find, I guess? @LostSock21 – Well, they were always further ahead on technology, right? @secade – Either that, or design references run on an approximately 50-year cycle. Actually, I read that in an article recently. @beowulf222 – My grandfather wants one! @ZSA_MD – Yes, these companies certainly want you to get on the merry-go-round of buying a new phone every two years or so. I, too, have been satisfied with my old Nokia candy bar phone. @Kellsbella – Am glad that I serendipitously chose your favorite word! =D@Devilzgaysianboi – Well, truth be told, I haven’t jumped on the smart phone band wagon yet. I’ll probably cave in soon, but have found that I spend so much time in front of a computer for my job that when I’m out and about, not having a computer with me is a joy. But I guess we all get caught up in the waves of technology, and eventually there will be an iPhone in my pocket. @ElusiveWords – You and me, both. @christao408 – Your *grandfather* has an iPhone? Seriously!? @beowulf222 – He has a mobile phone, not a smart phone.